Whether you are a new visitor or consider Gettysburg home (or your home away from home! ), there is a prominently new feature you can’t help but notice. The stately Hancock Avenue Gateway Entrance has returned to the original location it held in 1923. This isn’t the first rendition of the gateway. When the Gettysburg Battlefield Memorial Association (GBMA) acquired the land that is now part of Gettysburg National Military Park, they needed to create roads, pathways, and access points. When they laid out Hancock Avenue in 1882 (appropriately named as it followed the movement of Gen. Hancock’s troops), they created an opening in the stone wall on the west side of Taneytown Road, to allow access to the avenue. They monitored access by erecting two wooden posts with a wooden gate with a wire. In 1889, the GBMA erected another rendition thanks to a donation of iron fencing from the United States Congress. This fencing was originally used to enclose Lafayette Square Park in Washington, D.C. Later that year, the board of directors resolved to use a portion of the fence for the erection of a gateway at Taneytown Road. 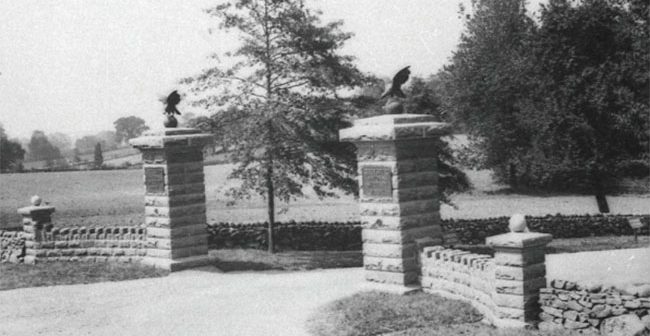 The gateway had two ornamental iron posts topped with iron eagles and curved panels of iron picket fencing. The gateway did not have a gate attached. Finally, in 1923 the current Hancock Gateway was erected. The gateway was proposed by Col. John P. Nicholson and designed by E.B. Cope in 1922. Both men were Civil War veterans and worked to develop the vision of Gettysburg veterans to preserve the battlefield and create a commemorative landscape. Nicholson was the first park commissioner when the government took over stewardship from the veterans, and Cope served as the commission’s first engineer and its first superintendent. The gateway was constructed as a “finishing touch” to Gettysburg National Military Park. Charles Kappes, a local stonemason who laid the foundations for a number of monuments on the field, raised the foundations for the gateway entrance but Commission employees finished the remainder of its construction. The gateway’s stone is native to the Gettysburg battlefield, taken directly from Little Round Top. The two bronze eagles, two bronze U.S. seals, and two tablets inscribed with “Gettysburg National Military Park” were cast by The Bureau Brothers foundry in Philadelphia. Again, no gates were installed. The National Park Service dismantled the gateway to accommodate the Cyclorama building and the relocation of the Hancock Avenue entrance at Taneytown Road in the 1960s. Fast forward to 2016. If you look through the gateway today, you’ll see the battle area that is known as Cemetery Hill. Less than a decade ago, this key battle area was the home of the old Visitor Center, a parking lot, and the Cyclorama building. Park Rangers couldn’t fully interpret what happened on this land for visitors because visitors couldn’t visualize beyond the obstructions. Gettysburg Foundation has taken over the work of the GBMA and has worked with Gettysburg National Military Park on this project for the past six years, which first included the demolition of the old Visitor Center, demolition of the Cyclorama building, and removal and rehabilitation of the former Visitor Center parking lot. Visitors can now not only see what the soldiers in 1863 saw but also how the veterans commemorated it.